When you are lost or disoriented, your brain uses cues from your surroundings – landmarks both near and far – to sort out where you are. The information gathered by your senses is transmitted by nerve cells, or neurons, to specific brain regions where the signal is routed through circuits and sent downstream to areas that essentially translate the information into behavior and get you back on track. Cembrowski's primary research target is the subiculum, a sub-region of the mammalian brain located in the hippocampus, which plays an important role in memory and navigation. The subiculum is the primary "output" for the hippocampus – it sends signals to various brain regions via a special class of neurons called pyramidal cells. The brain uses two kinds of cues for navigation – local (based on the immediate environment) and global cues (based on distant objects or unique identifiers of a space). Cembrowski and his colleagues wanted to understand the extent of the variation of pyramidal cells in subiculum and, if they could identify distinct subclasses, associate them with differences in information processing. The launching point for this research was an experiment performed by Cembrowski's former lab partner, Austin Graves. That work showed that pyramidal cells exhibit two distinct firing patterns in the subiculum – some spiked once, while others spiked in bursts. They investigated pyramidal cells in the dorsal region of the subiculum – an area linked to the processing of information about the animal's environment – using a multi-pronged approach, integrating methods from cell biology, genetics, circuit analysis, and behavioral neuroscience to zero in on the neural roots of spatial recognition. "We could have studied this concept from any one of those particular perspectives," says Cembrowksi. "But the power of being at Janelia is you don't need to compromise – you can do them all at once." Cembrowski worked with three of Janelia's support teams – Quantitative Genomics, Anatomy and Histology, and the Vivarium support team – as well as the MouseLight project team. Their first step? To trace the paths of the pyramidal cells and see if subclasses of cells could be distinguished based on their downstream targets. Cembrowski used special retrograde beads that travel from the end of a neuron back to its point of origin. He injected two colors of beads – magenta and green – into two different target brain regions. 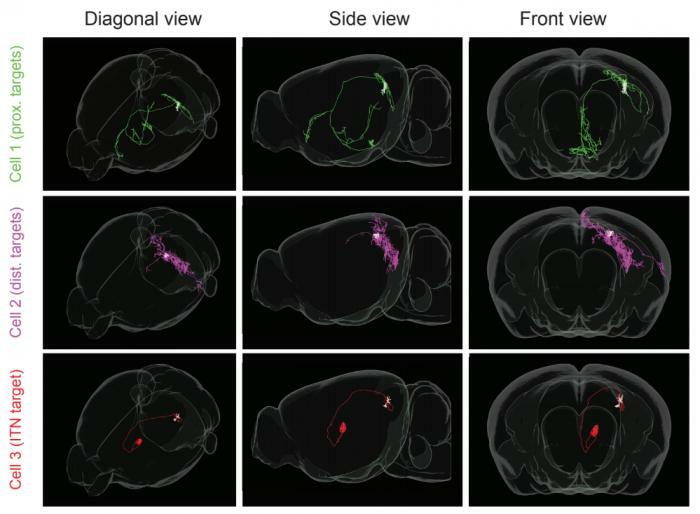 He followed the paths the beads traveled back to the subiculum and found that the magenta and green beads landed in two distinct spatial niches in the dorsal subiculum; thus, highlighting differences in connectivity. "That's the craziest thing about our research," he says. "We're finding out that this brain region – the subiculum – varies in every spatial scale on which the nervous system operates – from molecules to cells to circuits. But this is just the opening of the rabbit hole," says Cembrowski. Cembrowski et al., "Dissociable Structural and Functional Hippocampal Outputs via Distinct Subiculum Cell Classes." Cell. Published online April 19, 2018.